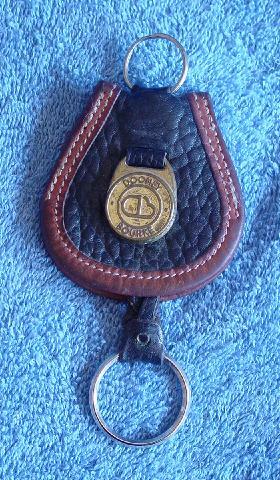 This vintage black and saddle tan leather key ring is by Dooney & Bourke. It's two matching flaps (same pieces of leather black and tan) that are folded over and sewn halfway down each side. The bottom area is open and there is an open area at the top. There is a 3 1/2" long leather braid with a ring at the top and a larger ring at the bottom. 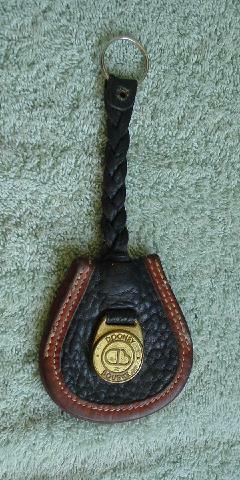 The front side has a somewhat tarnished gold/brass-tone Dooney & Bourke logo ornament. rings end to end 6 3/4"